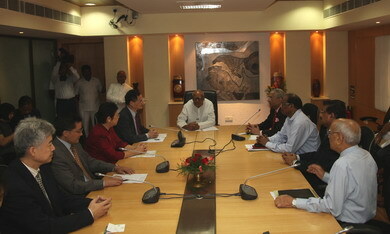 On the morning of November 11, 2010 in Hyderabad, Chinese Ambassador Zhang Yan met with Mr. Konijeti Rosaiah, Chief Minister of Andhra Pradesh. The two sides exchanged views on the development of China-India relations and the cooperation between China and the Andhra Pradesh. Ambassador Zhang expressed his appreciation on the contributions to the development of China-India relations made by Andhra Pradesh and briefed the purpose of this trip: First, to launch the "China Week" in Hyderabad amd to celebrate the 60th anniversary of China-India diplomatic relations. Zhang said the "China Week" included a series of colorful and meaningful activities such as seminar, receptions, photo exhibition and film festival in the hope to enhance Indian public's understanding of the development of China and the China-India relations, further promote the development of bilateral relations. Second, to visit the local government officials, businessmen, scholars and media representatives, etc. and to explore ways of expanding China-India cooperation. Third, to know more about the information technology, biotechnology, pharmacy, entertainment and other mainstay industries in Hyderabad, in order to deepen economic and trade cooperation with India. Ambassador Zhang said that the China-India economic and trade cooperation was developing very fast in recent years and many Chinese companies had invested in Andhra Pradesh. This year coincides with the 60th anniversary of the China-India diplomatic relations, the two sides should seize the historical opportunity to further extend cooperation and create a win-win situation. Ambassador Zhang also expressed his wishes to make this visit an important starting point for the cooperation between China and Andhra Pradesh. Rosaiah said that Hyderabad was the pharmaceutical center in India with 40% of the pharmaceutical companies. Rosaiah said that Andhra Pradesh very much welcome Chinese companies' investment, and the local government would provide all necessary support and assistance. Rosaiah hoped that the Chinese government would set up a trade office and Andhra Pradesh wish to receive Chinese high level delegations and made the visit as the opportunity to expand the all-round China-India cooperation in the fields of politics, economy, culture and education, etc.